NOTICE: FOR SECURITY REASONS, THIS PAINTING IS NOT IN MY RESIDENCE, SHOP OR STORAGE. IT IS IS A THIRD PARTY SAFE AND SECURE LOCATION. NOTICE! THERE IS A GLITCH IN SYSTEM NOT ALLOWING OUR LISTINGS FOR MORE THAN $50,000. LISTING AMOUNT X3 IS THE PRICE= $150,000, THAT IS THE PRICE. NO EXCEPTIONS. IF YOU WANT TO ORDER CONTACT US FIRST, WE CAN SEND ARRANGEMENTS FOR SECURE AGREED INVOICE FOR PAYMENTS OF $150,000, PAYPAL OR CC, AND FEE ADDED TO PRICE, CASHIER'S CHECK AND PERSONAL DELIVERY CAN BE ARRANGED ONCE BUYER IS CONFIRMED AND VETTED. ESTATE SALE - REDUCED $27,500 FOR LIMITED TIME WAS $187,500 NOW ONLY $150,000 FOR LIMITED TIME. FIRST TIME THIS PAINTING OFFERED SINCE MADE 1953! BELIEVED LOST - IT HAS BEEN IN ONE OWNER'S PRIVATE COLLECTION SINCE 1959. RAREST AND BEST OF THE ELVGREN PAINTINGS! CALLED BY ELVGREN EXPERTS ART AMISE AND DANIEL VANCAS AS ELVGREN'S GREATEST PINUP! TO MEET FOR PERSONAL INSPECTION ON REQUEST. MUST BE PRE-QUALIFIED AND ID CONFIRMED. - ALSO APPEARING AS "KING OF HEARTS" ON THE POPULAR ELVGREN PINUP PLANNING CARDS. -SHIPPING MUST INCLUDE FULL INSURANCE. SHIPPING COST IS ONLY ESTIMATED FOR THE USA, MORE FOR OVERSEAS. ASK FOR FINAL QUOTE ON SHIPPING AND PACKING WITH INSURANCE COSTS. Pinup girl in beautiful corset, wearing black seamed stockings and see-through negligee robe. The subject is both a confident romantic and demur. 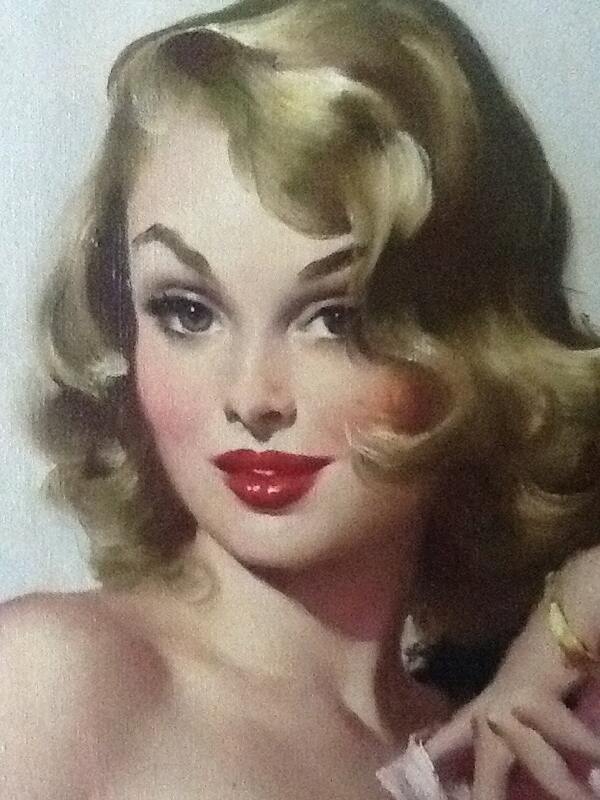 Top Elvgren experts, Art Amise and Daniel Vancas both agree this is the top Elvgren pinup of all time! Yes, this is the real and certified, deal! 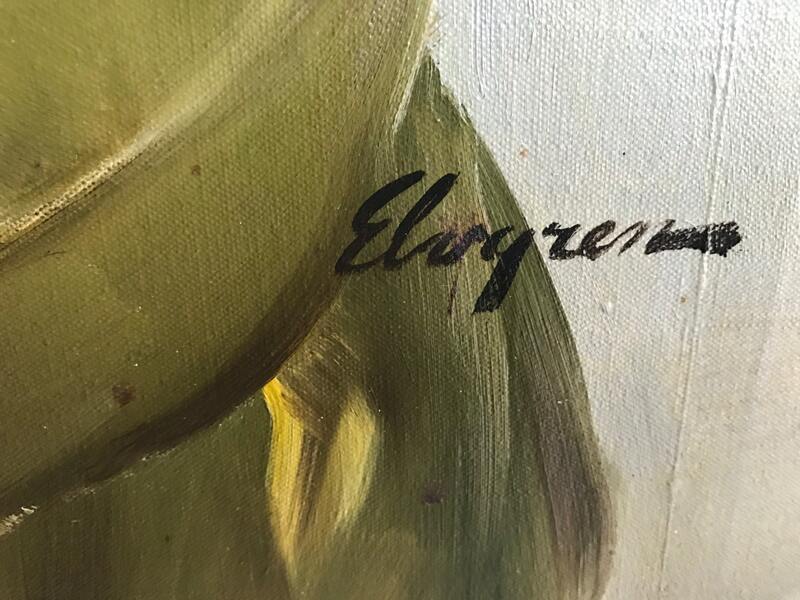 Your certificate of authenticity signed by Daniel Vancas, for 25 years the primer Elvgren art expert, a fully authorized Elvgren restoration artist and fine art publisher. Great condition for age, and typical of Elvgren paintings with stable oil crazing. The painting has been cleaned. A Rare resale from the private owner after apx 60 years! Never offered before, don't miss out! - FULLY AUTHENTICATED, SIGNED , CREATED IN 1952/53. TO BE CREATED AND SHIPPED BY A PROFESSIONAL 3RD PARTY ART SHIPPER - FED/EX, INSURED. YOU WILL PAY SHIP COST DIRECTLY TO THE 3RD PARTY SHIPPER. ONLY THE ACTUAL SHIP AND PACKING COST WITH INSURANCE. DONT MISS OUT - THIS IS THE FIRST AND ONLY TIME THIS IMAGE HAS COME UP FOR RESALE IN 64 YEARS! This image is known to be a (c) BB all rights res. WANT TO BE A PINUP GIRL, OR HAVE ME PAINT A NEW CUSTOM ORIGINAL FOR YOU? NO CHINESE OR OFFSHORE ART MILLS, NO FAKE NAMES, NO "NON-DE-PLUME" NO "UNNAMED AMERICAN ARTISTS " AND NO "FAKE ELVGRIN ARTISTS"!